We all leave our footprints on this earth, some are like prints on the seashore: washed away by the first wave, seeming never to have been. There are however footprints printed in a firm clay surface that last through the ages. Longlasting footprints she has indeed, this lady. 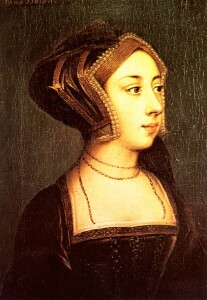 Her little feet set their first steps upon this earth in England, at the beginning of the 16th Century. Little is known about those first steps. We don’t know exactly when her feet started walking and at which location. How different are her last inprints in this world. Place, time, circumstances …. many noblemen witnessed them and records of this event were passed to us across almost 500 hundred years. Her life started comfortably. Being one of three children from an Earl and a Countess she had a happy childhood in a beautiful castle in the country. When she grew older she was educated in The Netherlands and France and then became a maid-of-honour to Queen Claude of France before she returned to England. At the court of King Henry VIII she was given the position of lady-in-waiting for the Kings wife, not knowing at that time what extreme consequences that decision was going to have. For her and for her country. King Henry fell in love with her. Not a brief inclination, but a deep and genuine state of mind. He had to go to great length to win her over, but finally succeeded. He got his 24-year marriage with his first wife annulled, in the process breaking up with the Pope and Roman Catholic Church as well. The happy royal couple got married and the young bride soon “was with child”. So far her life was like a fairy tale and yet it all ended in tears. fascinated him when he first met her, turned into a barrier when they were married. The unthinkable became true. her to death, to take her life. Was it all worth it? Was the fact that his love for her was the key to the English Reformation, wanted or unwanted, worth her fate? Was their beautiful daugther who was going to be England’s queen for several decades, who played a major role in the progress of the Reformation and skilfully led the country through years of florishing art, trade and prosperity worth her suffering? The example she was, as an educated and intelligent woman with an opinion of her own, did it outweigh the fact that her life had been taken? It almost did, but life is too precious to be taken. She could have done so much more had she lived longer. Another young woman’s life would have been spared, if only she had. A german princess might have had a succesful marriage and become mother of several children. Had love lasted, what would king Henrys life have been like? What would he have accomplished to the glory and benefit of his realm, with this extraordinary woman at his side? Her life as well as her death have their impact on history. We will never know what it would have been without her, she has changed its course forever. Her footprints will remain. Boleyn is her name, Anne Boleyn. Iv just read this and I think it’s beautifully worded, it reads like a poem. Had Henry decided to give Anne a second chance she could well have become pregnant again and given birth to a son, in fact she could have given him several more children as she was fertile, some women after a difficult birth are advised not to have anymore children for some years as they may not be healthy, of course in those days it would be unheard of, the more the better therefore Anne and Katherine weren’t allowing their bodies any rest before becoming pregnant again, that could be why there was several miscarriages and still borns, Henry wouldn’t have considered allowing his wives to have a rest from producing his heirs however, as time was of the utmost importance, if it’s true that Anne was about thirty five ish when she died she still some more years left to her, but yes had she not died then Henrys other four marriages would never have happened.